So, your home or office in Seattle is need of a sewer line repair and you’re wondering which of your options is best. Well, first things first, you should make sure you understand exactly who is responsible for said sewer. As we covered in our last blog post, if you’re a homeowner dealing with a ruptured sewer line that leads from your house to the city line, you may be financially responsible for it. But FYI, if the rupture is past the city main, you’re off the hook. Whatever the case may be, Bob Oates plumbing, sewer & rooter can help you diagnose and deal with your sewer line issues cost effectively through trenchless sewer line repair. First we employ cameras that we fish down your sewer in order to understand exactly what the issue is. Then, if the situation calls for it, we employ Nu Flow’s epoxy pipe relining technology to reline your sewer without having to dig any trenches. Time is of the essence when it comes to sewer repair in Seattle. Not only do repair costs quickly compound when a ruptured sewer line goes untreated, but in Seattle, with the excess of rain and the proliferation of root systems, even a minimal sewer leak can lead to some serious problems, like structural damage and sinkholes. If you’ve got a ruptured sewer in Seattle, you need to take care of it ASAP. Compared with traditional sewer repair, trenchless sewer repair saves a significant amount of time and energy. By utilizing Nu Flow’s innovative epoxy pipe lining technology, we can have your sewer cleaned and repaired in no time! The great thing about Nu Flow is that it works for a variety of sewer repair issues, including preventative maintenance, all without requiring that my team dig up your yard, which brings us to our 2nd undeniable benefit of trenchless sewer line replacement. Hey, it’s called trenchless for a reason! When it comes to the concerns of my clients, this benefit is definitely the most attractive aspect of trenchless sewer repair in Seattle, and the one that allows for the other 2 of our undeniable benefits. With typical sewer line repair jobs, there’s a lot of digging and excavation involved. Aside from the time it takes, the main problem with digging comes down to the fact that sewer leaks are not mindful of convenience. In fact, over my years of experience performing sewer repairs in Seattle, it seems like the opposite; sewers always seem to leak right below your driveway, or your perfectly landscaped backyard, or under your garage. With typical sewer line repair, this means that you’ve now got to dig down below your driveway, garage, or backyard to address the issue. Then, once the rupture is properly dealt with, there’s no telling that the above ground will be returned to normal, or even remotely resemble what it looked like prior to repair, without you having to spend A LOT of money. This brings us to the last of our undeniable benefits of trenchless sewer repair. Time is money, particularly when it comes to trenchless sewer repair in Seattle. When you compare a typical sewer repair job with those of a trenchless repair, trenchless only takes up a fraction of the labor, time, and money. Why? Excavation has a lot to do with it. Not only does digging down to your sewer line take a lot of time, it also costs a lot of money, both during and after the repairs are complete. Additionally, trenchless methods of repairing sewers are cost effective because there are no structural modifications that need to be made to the pipes. In fact, we can repair your existing pipes and make them better than before! 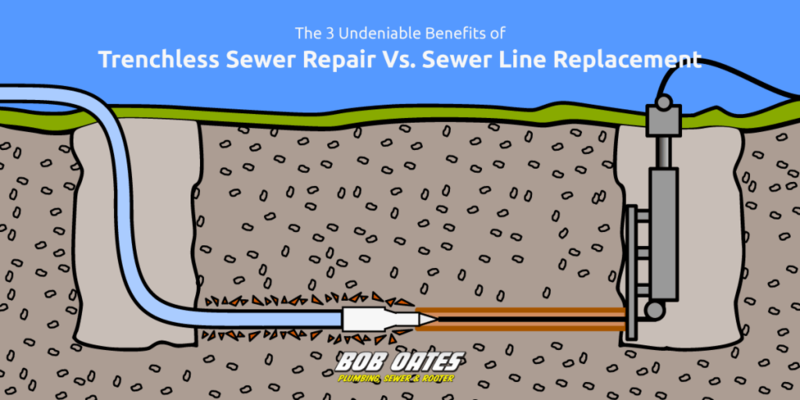 Thanks to Nu Flow’s trenchless repair technology, the team at Bob Oates can repair your sewer line in a fraction of the time and extend it’s life far further than what’s typical of sewer lines in Seattle, which will help you save even more in the long run. It’s important to note that Trenchless sewer repair isn’t for everyone. There are certain scenarios in which we’ll be unable to diagnose and deal with the problem from above and we’ll need to get to digging. But trust us, at Bob Oates Plumbing, Sewer, & Rooter, we want what’s best for you, and we only employ trenchless sewer repair in Seattle we can safely and effectively utilize it. Whatever your sewer needs, whether it’s an inspection, maintenance, a repair, or a cleaning, the experts at Bob Oates plumbing can help you diagnose and deal with your sewer’s issues as cost effectively as possible. If you need help with trenchless sewer line repair in Seattle, or any of the other extensive services provided by Bob Oates, don’t hesitate to get in touch!